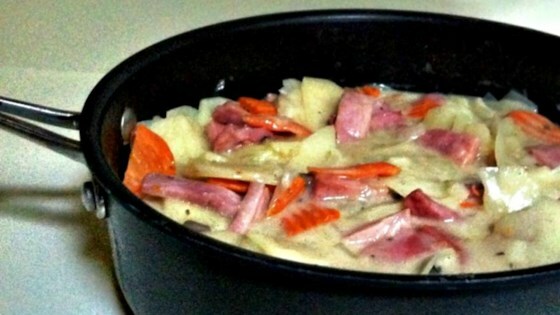 "This has a sweet and salty taste balanced out by the creamy potatoes. My kids have loved this dish from an early age, and still love it as teenagers." Melt butter in a large skillet over medium heat; add ham and brown sugar. Cook and stir ham until browned, about 5 minutes. Remove ham with a slotted spoon to a plate, reserving drippings in the skillet. Stir cream of mushroom soup, evaporated milk, water, onion, salt, and pepper into the reserved drippings in the skillet; add potato slices and carrot pieces. Place a cover on the skillet, reduce heat to low, and cook mixture at a simmer until potatoes and carrot are tender, about 35 minutes. Return ham to skillet and continue cooking until ham is hot, about 10 minutes. An apricot jam, dry mustard, and brown sugar glaze makes baked ham special. Absolutely Delicious!!!! I did not use mushroom soup and I added broccoli. My family loved it. Thanks for sharing this recipe. Didn't add the evaporated milk, just more water. Delish!!! I made this with sweet potatoes! So much better!